Ron Patlian, Manufacturing Manager for Turbine Engine Components Technologies (TECT, Utica Corporation), Santa Fe Springs, California, was looking for a cost-effective CNC solution that wouldn't tie the plant to a traditional proprietary system. With a busy aerospace job shop producing thousands of parts each year, Patlian needed to increase manufacturing capacity without spending from $500,000 to $2 million each for new machine tools. He was tired of having production stopped by obsolete and expensive to repair proprietary NC controls that were plagued with frequent breakdowns. He needed a different kind of control, without constraints such as memory, program manipulation, and future repair parts availability. It would have to be simple and easy for people to install, operate, and maintain. 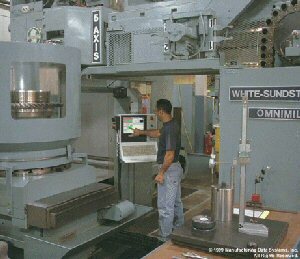 What he found was a unique CNC technology that could not only handle the tough demands of complex, high-end, five-axis aerospace machine tools, but also cut cycle times and increase uptime. In fact, overall machine performance improved so dramatically with the new CNC that Patlian recently set up a plan to upgrade many other five-axis machines that currently have older controls. What Patlian found was OpenCNC® software, the unbundled, all-software CNC from Manufacturing Data Systems, Inc. (MDSI). In an industry dominated by proprietary hardware CNC solutions, MDSI's OpenCNC has proven high-end, multi-axis CNC machine tools can be controlled entirely from software-without any motion control cards, proprietary hardware, or embedded firmware. OpenCNC provides a common control technology across a full range of machine tools: single- and dual-turret lathes, single- and multi-spindle precision drills, routers, mills, grinders, gear hobs, dial index machines, and gantry machines-all from a single operating system, Microsoft® Windows NT®, running from a single processor. Because the CNC is unbundled open-architecture software that runs on off-the-shelf PCs, manufacturers aren't locked into proprietary arrangements for hardware, control repair, or control upgrades-while OEMs can speed time to market and cut engineering costs with concurrent, non-linear, design development. Patlian didn't know he was looking for a software CNC when he first got on the Internet. He just wanted a better alternative to traditional CNC. "I didn't want to be tied to a proprietary product," he said, "so I started surfing the Internet and came across MDSI's Web site. Once I saw it, I knew that was what I had been looking for. The great thing about the MDSI control is that you can install it yourself, or have a local electrician help you, and you're not tied to anyone's product. It gives you the freedom to customize at a modest cost with the flexibility of Windows NT running on a 450 MHz PC." TECT, Santa Fe Springs, California, functions as an independent job shop for production-critical gas turbine engine and airframe components. Whether machining centrifugal compressor parts for helicopter engines, locomotive turbo-charger compressor wheels, or parts for commercial airplanes and jet attack fighters, the shop is competitive and profitable. 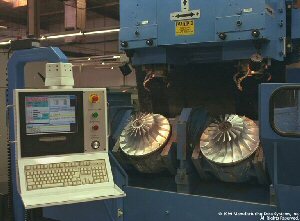 A major test for OpenCNC on two five-axis Omnimils was machining compressor rotors for fighter planes. Each part cost up to $65,000 in value added and took several weeks to machine. Scrap was not an option. After several months and several thousand dollars researching and testing PC-based controls that didn't produce the desired results, the change to OpenCNC came easy. "We gave OpenCNC a try and it delivered smooth continuous five-axis motion from the very start," Patlian said. "We do some very critical five-axis contouring and our machines need to perform right at the peak. MDSI delivered the servo control that worked." Increased capacity due to improved machine performance. If a machine tool runs twelve months out of a year when it only used to run ten or eleven due to electronic failures, manufacturing capacity is increased. In addition, several of the machine tools began running faster and better with OpenCNC. For example, a Rigid five-axis mill with OpenCNC ran almost fifty percent faster than it did with a previous control. Higher feed-rates could be set. "It now runs faster and cuts smoother," says Moe Zagha, CNC development and R&D machinist, and 18-year employee at the Santa Fe Springs shop. "The Omnimil axes used to wait for commands. Now, the control processes data so fast the machine is too slow for the control." Increased capacity at lower cost. Instead of purchasing a new $2 million large five-axis mill, Patlian bought two old Sundstrand Omnimils for $125,000 each and completely rebuilt and retrofitted them both for less than $750,000. The big mills have a 60" x 60" x 60" envelope and full five-axis continuous path milling capability. "Even completely retrofitting all the electronics, we saved money," Patlian said. "You can get new servo and spindle drives, plus a new electronic cabinet with OpenCNC at a price we were quoted for the control alone. Today with several more OpenCNC machines, Patlian feels he's made a sound management decision. "We can acquire machinesat a modest pricethat nobody else wants to touch, then modify and retrofit with MDSI to end up with a piece of equipment that will provide added capacity for a quarter of the new cost," he said. "It reduces the cost of capitalization, thus improving the stockholders return on investment." Part and program changeovers no longer an issue. "Changing part programs is simple," Patilian said. "Just point, click, and move the program from your network into the machine tool directory, and you're done. It's quick set up and total accessibility. The way our operators go back and forth between machine and programming functions using touch screen programmable switches is amazing. MDSI with Windows NT is a tough combination to beat." Save on operator training with a common control. Learning how to use OpenCNC was easy, reported Zagha. "Very easy, very logical," he said. "Just a couple of days and I was ready to go." For a manager, the benefit of having a common CNC across several machine tools is enormous. "If an operator has to deal with four or five different controls, he can't be as efficient," Patlian said. "Our operators now learn one system across several machines." What the TECT crew also enjoyed about the all-software CNC was getting instant DNC. "You don't need to buy DNC software," Patlian says. "With a couple of PCs, you can run to Radio Shack and buy some cabling, a hub and link as many machines as you wish using MS network software. What we say now is that with OpenCNC, we have a network of PCs that just happen to have machine tools connected to them." There are now over a dozen machines at the Santa Fe Springs plant running with OpenCNC, and the plans are to convert several more five-axis machines to OpenCNC. With the machine tools on OpenCNC running on Windows NT, the way is clear for remote machine diagnostics and maintenance via the Internet-or for taking advantage of OpenCNC's patented real-time data collection technology. With that, manufacturers can collect whatever machining data they choose-including maintenance, production and quality-in real time, without specialty hardware. The TECT shop hasn't had time so far to take advantage of OpenCNC's data collection features. They're busy with additional rebuilds and control upgrades using OpenCNC. "We have a terrific crew," Patlian says. "And a control that doesn't limit our horizons. I see no reason why we can't build our own specialized machines at some point in the future."